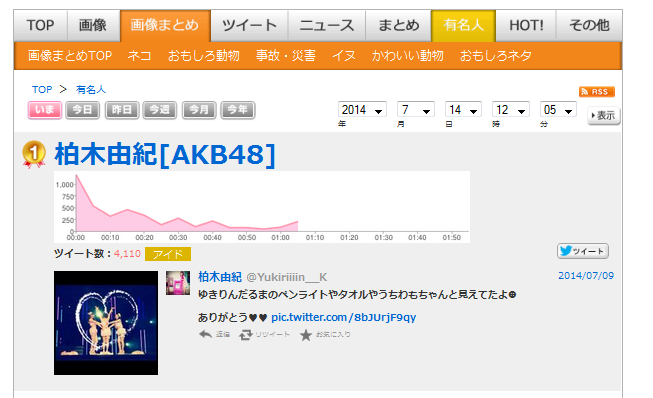 Yukirin trended at #1 for Famous People twice, the best one was of course within the hour when the clock hit midnight. Yukirin celebrated her birthday with French Kiss members abroad but I’m sure she felt the love around the world and from Japan. She thanked everyone on twitter and actually even used the same hashtag as the project!!!! I’m sure she was aware of the project just like she thanked fans last yr for the twitter project. It’s Yukirin World after all, glad to be apart of it. i understand yukirin twitter has pas 200k by now, but its kinda odd to america has more contribution than the japan itself. what site is it that records the ranking? oh by the way congrats and belated happy b-day to YUKIRIN!! the fact that yukirin personally noticed our project n thanked us, somehow makes me overwhelm with happiness.